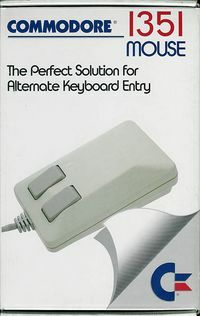 The Mouse 1351 is a mouse made by Commodore from 1986, which can directly be plugged into the 9-pin control port of a C64/128/D/DCR. 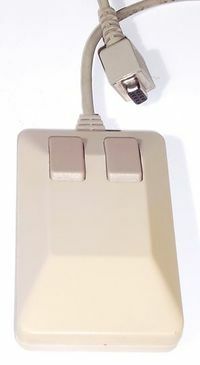 The Commodore Mouse 1351 has two buttons on the upper side and a ball on the bottom side. It works in two operating modes: the joystick mode and the proportional mode. The operating mode is decided when the computer is switched on: when the right mouse button is pressed, the mouse goes into the joystick mode, otherwise (default) into the proportional mode. 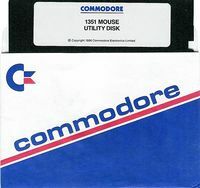 The "Mouse 1351" contained next to the manual also a Test/Demo-Diskette. The joystick mode enables the use of the mouse with every joystick-compatible software. It is also provided as a "reserve" for the case when the used software does not support the proportional mode. 1. Every movement is registered inside the mouse. The current position is transfered modulo 64 every 512 micro seconds to the SID registers POTX (for the x-position) and POTY (for the y-position), without the need of a software. 2. The left mouse button is connected as a joystick fire button. 3. The right mouse button is connected to the contact of the upward movement of the joystick. 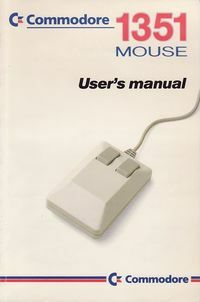 The "Commodore 1351 MOUSE User's manual" contains information about the mouse and the software interface in eight languages, as well as English listings for mouse driver and a pin-out. The content of the first side was an English menu program for the C64/128, which contained a standard and a more advanced driver as well as a short demo program for testing the mouse. This page was last modified on 29 December 2014, at 04:14. This page has been accessed 14,571 times.